New Version updated(1.5) with a special trend filter! Please Read it before start! I made an article on how to easy optimize it for your broker, pair and timeframe! WARNING: using Hendrix EA involves risk. You should not use it, if you are not aware of the risks associated with it. Do not risk money you cannot afford to lose! Test it in demo first! After so many requests for a solid and easy to use EA I developed Hendrix! People keep asking me something that doesn't over fit and can be optimized easily. Hendrix is a new generation EA that adapts itself to the market and uses some advanced techniques to prevent over fitting. It was developed to be easy to use even for the beginners and to provide a solid element for advanced traders' portfolios. 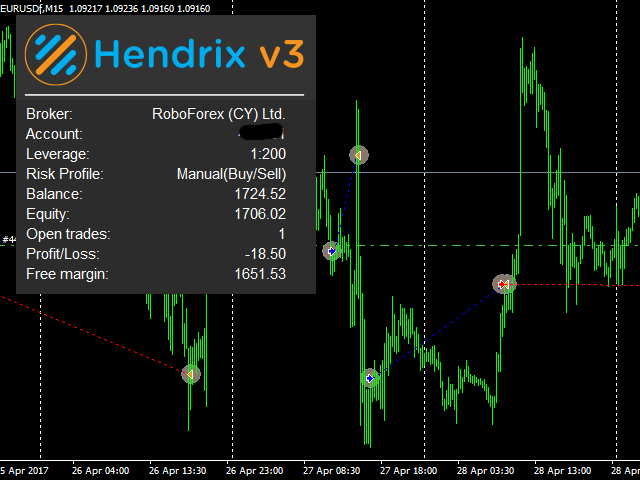 All parameters generating entry signals are dynamic and hidden and are the SAME for every instruments. 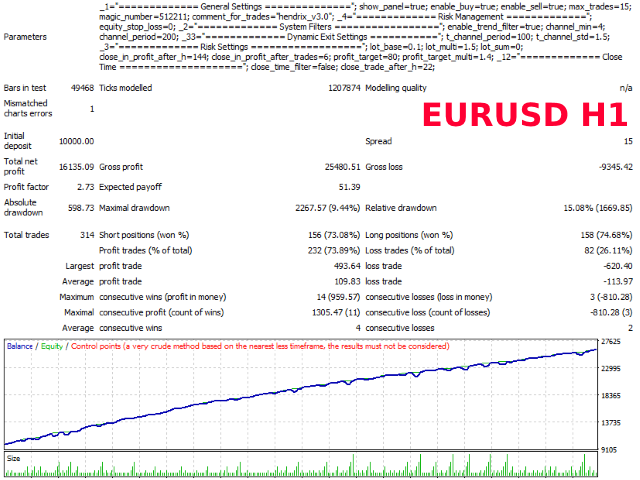 This prove the quality of the algorithm and that helps traders a lot because they don't have to worry about bogus backtests results and over fitting. The set of parameter to be tweaked are very small and they simply change the risk and time needed. You can adjust the risk for a specific pair optimizing very few parameters. I highly suggest you to optimize the settings for every pair for 1-2 years in backtest. You can safely use Control Point Mode because the EA is NOT spread sensitive and have a good tolerance so the Control Point Mode will be enough and you will save a lot of time. You have to optimize the "Risk Profile" section, once you have set "Risk Profile" to manual.Also if you want to trade some pairs in a specific direction(only buy or only sell) you can do that. This system is the ultimate evolution of the original Hendrix system from 5/3/2017. 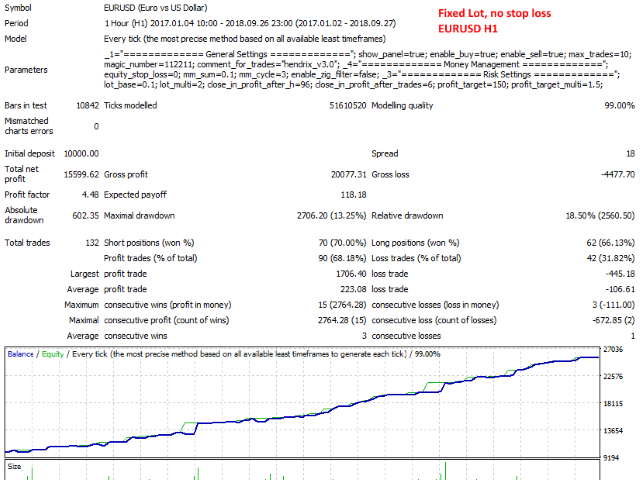 I trade with this previous version already 18 months very successfully and can only recommend this version to any trader. It is important to really follow the instructions and to use it only on the recommended broker. With little risk, a not so small balance makes the EA quiet and good profits. The EA is very stable. The developer Mr. Petrinic is serious and very communicative, he is always available for questions. Therefore 5 stars for the Hendrix. It works well if you follow the author's guide to optimize it or same broker. Thanks!! The system seems very flexible and solid. Can be used in different ways, but need to be optimized first. I put 4 stars only because I want to wait for the official optimizing process and see if it works for me; will expand the review in case. I updated the version with new advanced features and some algorithm optimization. 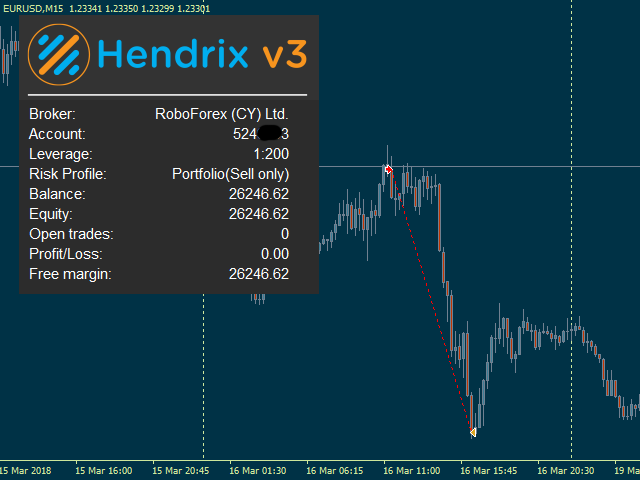 I removed the predefined risk profile since it is very easy to optimize it for your instrument/timeframe and also because some people got confused about it. 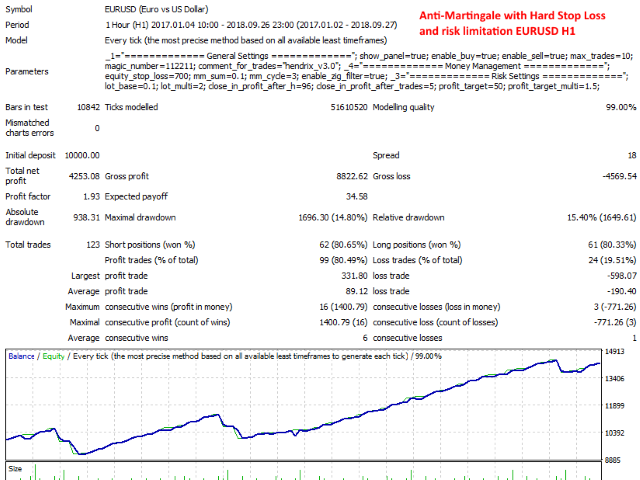 Now the EA is capable to use Anti Martingale techniques for the whole single sequence; combined with a hard-stop loss is a great way to control the risk.